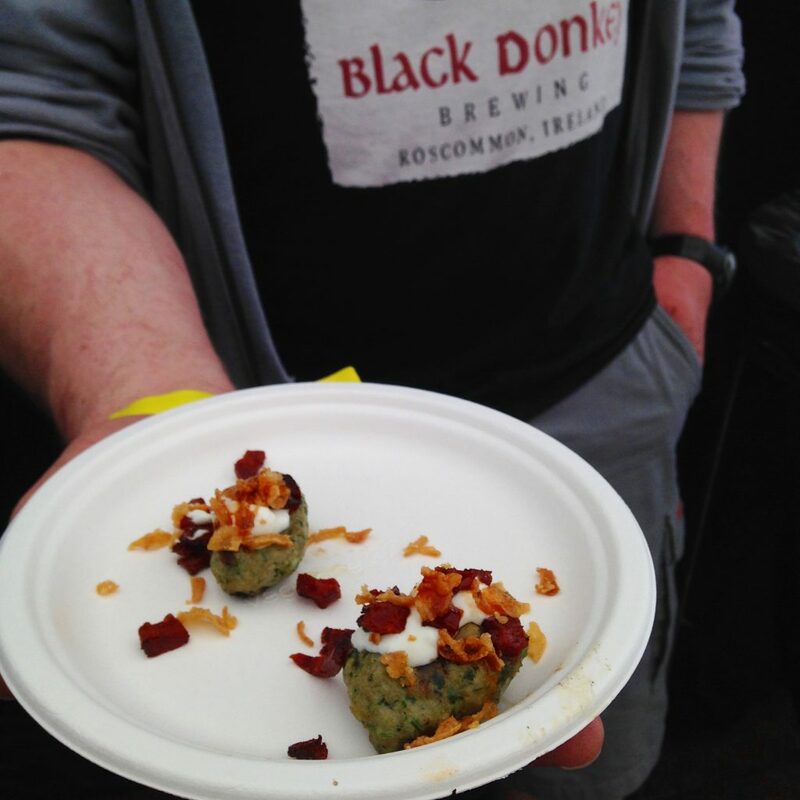 This year’s beer and food event at Killarney Beerfest was a little different; I got to work with Chad Byrne, head chef at The Brehon, who cooked on site and presented a selection of sampling dishes to complement flavours in the chosen beers. I’ve loved this saison from Roscommon from when it first arrived on the market. Dry and refreshing, it has a complex aroma and flavour which makes it one of my favourite beers to pair with food. Spicy and ever so slightly funky, it was well able to stand up against the full-flavoured dipping sauce while brightening the saline/porcine sweetness from the clams and prosciutto. 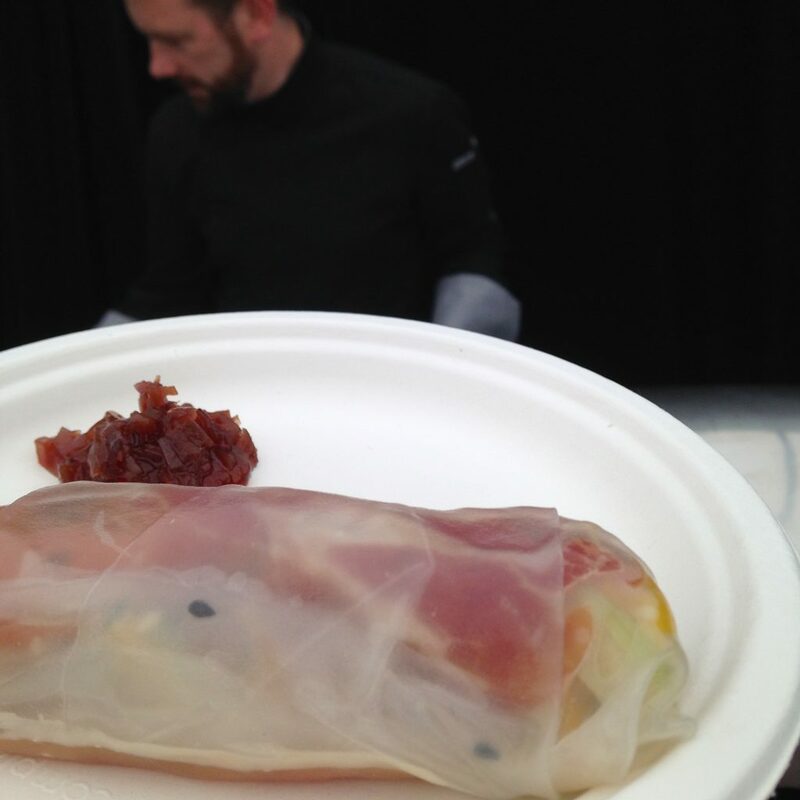 Food: Clam and prosciutto rice paper rolls, celery, carrot and sumac, red onion and rice vinegar dip. Light and fresh with a rich and sharp dipping sauce, the clams and prosciutto are a magnificent duo. Hoppy, bitter and full flavoured, this Killarney IPA has a darker, ruddier tint than most IPAs – it’s an IPA, Kerry-style! Sweet enough to complement the lamb, it also has enough hops to cut through the aioli while highlighting the herbal accompaniments. Food: Steamed buns, spiced lamb sliders with roast chorizo, feta aioli, basil and sorrel. Chad cooked these sliders on his Big Green Egg, which decided to be a little temperamental on the day, but the end result more than justified the means. Additional kudos for making those excellent steamed buns. 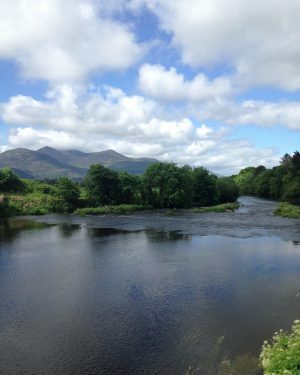 Everyone in the tent sighed – or moaned?! – when I announced what was coming their way for the last tasting. Richer and more full-bodied than you might expect, given the 3.8% ABV, this is sweet and smooth and coconutty enough to be desert all by itself. Pair it with chocolate and you’re into another stratosphere. Food: Little pots of chocolate brownie and coffee mousse, with pineapple sorbet. I had promised Kevin from Independent Brewing that I’d bring him one of these to try; do you think there was any left? Not even one for me to taste-test! Still, Chad’s idea was brilliant. Always a fan of chocolate brownies with porters or stouts, the coffee mousse was an extra element for the this beer to play with. Add some pineapple sorbet to contrast with the coconut and you have a multi-layered tastebud extravaganza. I think the audience – in a tent that got more packed as the tasting went on! – agreed. Thanks to Chad, Maureen, Alice, all the staff and the brewers for their help – and beer – at Killarney Beerfest. You can see some more pics of the action on the Bibliocook FB page.